A remarkable story that transcends sports, race and even Israeli history. It’s a story about humanity, grit and teamwork. An inspiring read for everyone. David Goldstein has written my favorite kind of sports book–one where an author reveals an entire world that I hardly knew existed before. Alley-Oop to Aliyah’s depiction of Israel’s unique basketball culture and the American imports who play in the country’s professional league is destined to become essential reading for anyone fascinated with basketball’s global appeal, and anyone who just loves the game. – Rafe Bartholomew, Former features editor, Grantland.com; Author of "Pacific Rims, Beermen Ballin’ in Flip-Flops and the Philippines’ Unlikely Love Affair with Basketball"
A compelling and honest look at the State of Israel from a totally unique perspective–through the eyes of African American basketball players. I’m thrilled that David Goldstein wrote this book–we are not a perfect country, but we are an extraordinary one, and some untold wonders of Israel are captured beautifully through the words and feelings of these beloved athletes who choose to make Israel their home. Alley-Oop to Aliyah masterfully weaves together a series of individual stories that together make up a collective sensation. Serving the combined role of interviewer, narrator, and educator, David Goldstein has made a meaningful contribution in chronicling this slice of Israeli sports history. This is a thought-provoking and eye-opening book that is also a fun and important read. The phrase the “global game” is tossed around liberally these days, but David Goldstein connects those dots beautifully here. The rich history of African-American ballplayers making the trek to the other side of the world to pursue their hoop dreams, only to find out that the passion for the game in Israel is as strong as it is anywhere, was truly enlightening. If you didn’t already know that the ties that bind all of us hoops heads knows no boundaries, you will after reading this book. Coverage of the globalization of basketball tends to focus on the influx of internationals in the NBA. David Goldstein takes a fascinating look at a different kind of global drift: that of African-American players heading to Israel–a country with a vibrant hoops scene–and becoming far more than temporary reinforcements. 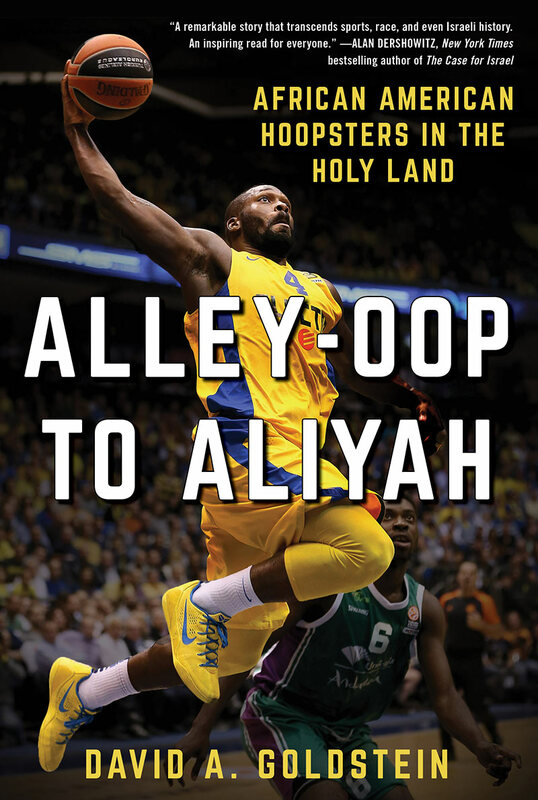 Alley-Oop to Aliyah isn’t just a basketball book; it’s also about immigration, religion, politics, and how players’ lives were changed by their experiences in Israel. In a fascinating journey that goes deep into the heart of Israel, Alley-Oop to Aliyah features a strong starting lineup of faith, Chutzpah, politics, anthropology and romance, united by love – for a ball and a country. The book lets us see and experience Israel through the unfiltered lens of the people we used to admire, in a way we’ve never read before.